What time travelers can expect to experience. 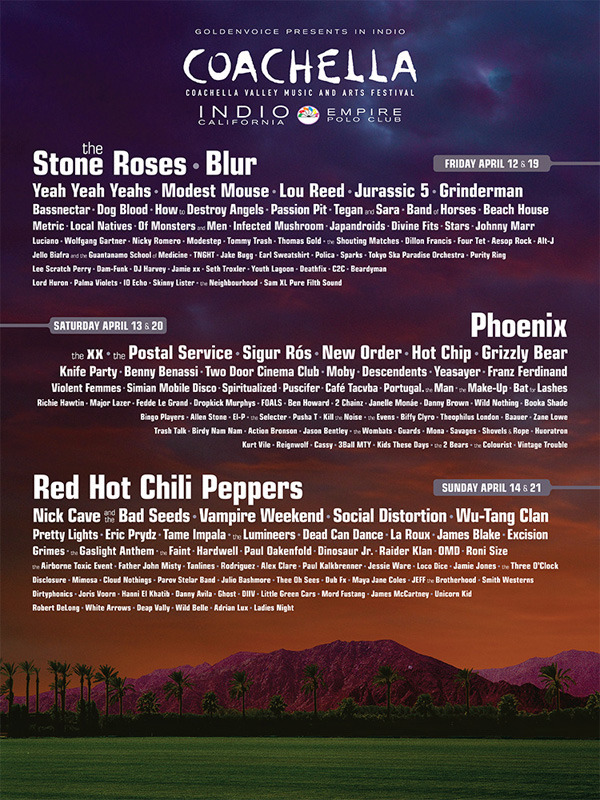 Coachella organizers announced today that for the first time ever you will now be able to venture back in time. While details of the process are still top-secret, the newly announced time machine is said to only be able to take you back roughly one decade and your first stop will be a music festival featuring all of 2003's greatest bands. Those lucky enough to experience this modern miracle will bear witness to such great early-aught performers like Blur, the Stone Roses, Moby, and Hot Chip, among others. Time travelers will also get to see the Postal Service who, though only a Ben Gibbard side project in 2003, will get top-billing alongside luminaries like Sigur Ros and New Order. “Though they only had one full length, a decade of not producing any new music has done a lot to boost the credentials of the Postal Service, so we wanted to put them near the top of the bill even though in 2003 they probably would've been an opener,” our source admitted. “We got that trick from the 1997 Warped Tour,” the organizer chuckled. Oddly, the second night of both weekends will be headlined by someone called Phoenix. We assured him that no one has. Tickets to ride the world's first time machine will go on sale next Tuesday at 10am. The price has yet to be announced, but financial strategists believe it will be somewhere in the ball-park of a used 2003 Buick.